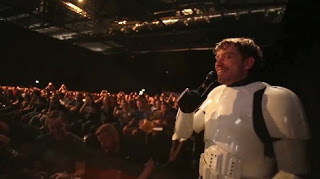 Gareth Edwards wasn't the only celebrity walking the floor in disguise at Celebration Europe. Alden Ehrenreich took a stroll around the floor in a stormtrooper mask just hours before he was unveilled as the new Han Solo. This follows in the footsteps of John Boyega and Daisy Ridley (Finn and Rey) who walked the floor at Star Wars Celebration Anaheim last April.